W/LIP research has produced knowledge for action that has been applied in courses at Wharton and in Penn’s Law School, Engineering School, School of Medicine, and universities worldwide. 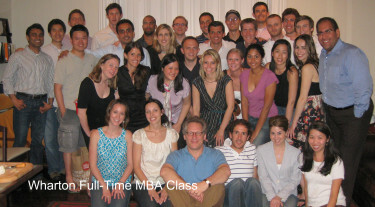 In the early 1990’s short modules on work/life integration, based on the first W/LIP survey research on the lives of Wharton students, were incorporated into the Wharton MBA core course on leadership and teamwork. But it wasn’t until 2001 that a full course was developed and Wharton became the first business school to offer a course on the integration of work and the rest of life for developing leaders. Known as Total Leadership, the course was created by Stew Friedman at Ford Motor Company in 2000, when he was on a two-year leave from Wharton, serving as the senior executive responsible for Ford’s leadership development activities worldwide. It is based on evidence from the large-scale research on students and alumni described in Work and Family – Allies of Enemies? (Oxford University Press, 2000, co-authored with work/life scholar Jeff Greenhaus), on the findings of best practices by experts convened at W/LIP conferences, and on the materials gathered for our first-of-its-kind collection of learning activities, Integrating Work and Life – The Wharton Resource Guide (Jossey-Bass/Pfeiffer, 1998). The essential elements of this course are described in the book — Total Leadership: Be a Better Leader, Have a Richer Life, which was a best-seller and has been published in multiple languages. It challenges the traditional idea that life is a zero-sum game and that the more we strive to win in one dimension (such as our work), the more we have to sacrifice performance and satisfaction in the other three dimensions (family, community, and private self). It shows how we don’t have to make trade-offs between life’s most important domains, and certainly not as often as we think. Nor should we! A trade-off mindset makes people feel all manner of painful emotions—including inauthentic, unfocused, rootless, resentful, and overwhelmed. It hurts those we care about most and it prevents us from leading and performing effectively in every part of life. Being real—acting with authenticity by clarifying what’s important: Understanding how crucial events in the past have shaped one’s values and aspirations; assessing the relative importance of work, home, community, and self; taking stock of how much time and energy is invested in each of these four domains; and diagnosing one’s level of satisfaction in each. Being whole—acting with integrity by respecting the whole person: Identifying the most important people in one’s life and their performance expectations, determining how different expectations affect one another, assessing how one uses different media for connecting with these “key stakeholders,” and preparing and conducting dialogues with each one to verify assumptions and see things through their eyes. Being innovative—acting with creativity by experimenting with new solutions: After seeing both what and who are important in a fresh light, designing and implementing small, smart, potent experiments that swiftly produce better results in all four parts of one’s life and that transform alienation, exhaustion, and resentment into feelings of purpose, authenticity, connection, and optimism. Based on research and real-world application in a variety of settings, this approach is rooted in sound principles and has been proven effective with thousands of people. One study of over 300+ students in Wharton’s MBA for Executives program showed increases in satisfaction across the board: an average of 20 percent in their work lives, 28 percent in their home lives, 31 percent in their community lives, and 39 percent with their physical, emotional, intellectual, and spiritual well-being. And they reported that their performance at work, at home, in their communities, and within themselves has improved by 9, 15, 12, and 25 percent, respectively. These powerful results occurred even as they spend less time on work and more on the other parts of life—they were working smarter and enjoying the benefits of more intelligent choices for bringing the different elements into a coherent whole, creating mutual value among them. Total Leadership is not an abstract theory: Practicing this method results in demonstrable improvements in performance and satisfaction. The course has been taken by 1000+ Wharton undergraduates, full-time MBAs, and students in our MBA for Executives program in Philadelphia and San Francisco. Since 2008 the course has used an innovative interactive Web site that applies social media tools to enable peer-to-peer coaching; there are 2100+ registered users now on this site. This 10-week course has been offered three times on Coursera.org. Over 136,000 people in 200 countries have enrolled in it. The instructor rating for this course was second-highest of all University of Pennsylvania courses on Coursera. This practical course has been taught to thousands of students at Wharton and elsewhere by Friedman since 2001. Described in the best-selling, award-winning book Total Leadership: Be a Better Leader, Have a Richer Life (Harvard Business, 2008) and the best-selling Leading the Life You Want: Skills for Integrating Work and Life (Harvard Business, 2014), this course teaches you a proven method that shows how you don’t always have to make trade-offs between life’s most important domains, and certainly not as often as you think. Nor should you! A trade-off mindset makes people feel all manner of stress – unfocused, resentful, and overwhelmed. It hurts those you care about and prevents you from performing effectively to produce results that matter in every part of your life. In this course you learn how to articulate your values and personal leadership vision, cultivate supportive relationships with people who matter most in all parts of your life, and continually experiment with how you get things done to better align your actions with your values — and so produce positive sustainable change. This step-by-step method for pursuing what professor Stew Friedman calls “four-way wins” has enabled people all over the world to become more successful and satisfied leaders in all parts of life: work (or school), home, community, and the private self (mind, body, and spirit). It’s about growing as a leader in all parts of your life and having fun while doing so. You watch video lectures, do weekly assignments (including conversations with important people in your life and real-world actions you take to improve your performance in all parts of your life), and take a final exam. You have the opportunity to do practical exercises that help you clarify your values and vision, determine who matters most in your life and clarify expectations with them, and design experiments to create positive change in all parts of your life. You have the option of doing this course on your own (Individual Track) or in concert with others (Community Track). In the Individual Track you answer assignment questions in a journal for your own use. In the Community Track you post answers to these same questions and exchange feedback on them with your classmates. Students in the Community Track exchange feedback on weekly assignments with other students. Students in the Individual Track do not exchange feedback but complete short weekly quizzes about the lectures instead. For a more detailed description and course syllabus, please go here. The Total Leadership course engages a corps of TL Mentors; alumni who have taken the course and then volunteer to support a current student throughout the term as a coach. Over the past decade hundreds of alumni have participated in this role, many more than once. Contact us to learn more. Alumni who are currently serving as mentors for students in our Total Leadership course came to campus recently to share their wisdom. 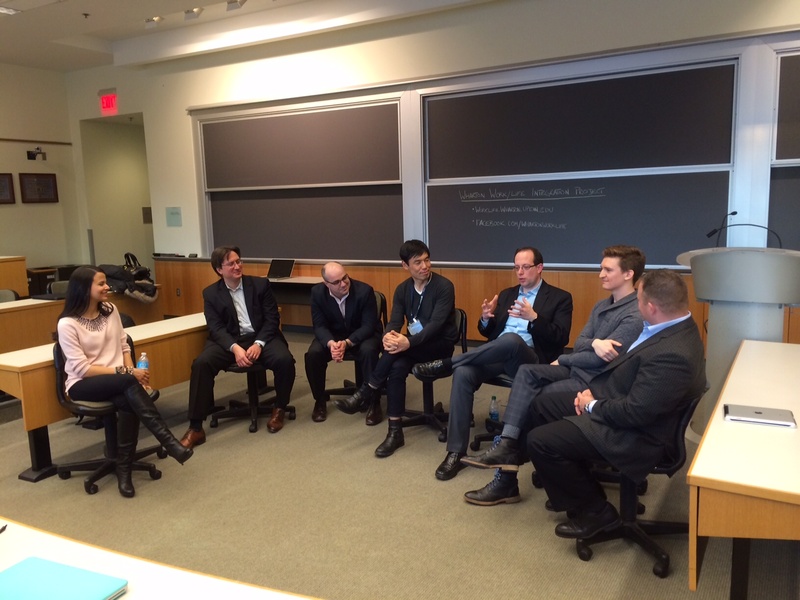 Pictured here are Judith Duval W’03, Eugene Lebedev WG’10, Rich Meene WG’11, Goshin Mizuno WG’12, Matt Jennings WG’12, David Tucker W’09, and Sean O’Reilly WG’10. Short versions have been delivered to 1000+ participants in a variety of Wharton Executive Education programs, including with American Bankers Association, the Securities Industry Institute, UnitedHealth Group, the Advanced Management Program, and most recently in a program for alumni on Zen Capitalism. The course was one of the main interventions in an NIH-funded four-year grant that explored creative ways to improve the lives and careers of women faculty in academic medicine. (A cover article in Penn Medicine magazine described this project.) A version has also been taught at Penn’s Law School. And a few years ago we pioneered its use in the School of Engineering in collaboration with Prof. Dwight Jaggard. Faculty in universities and schools of business around the world (throughout the U.S. and in Canada, Chile, France, Germany, Japan, Romania, and Spain) are using the book, Total Leadership, as a teaching resource, and some are using our social learning site too.